During the second week of filming the Marlborough Rugby Club, I had to stop filming them and change my idea. This was because some of the important people I needed to film pulled out or went away so I was unable to film. 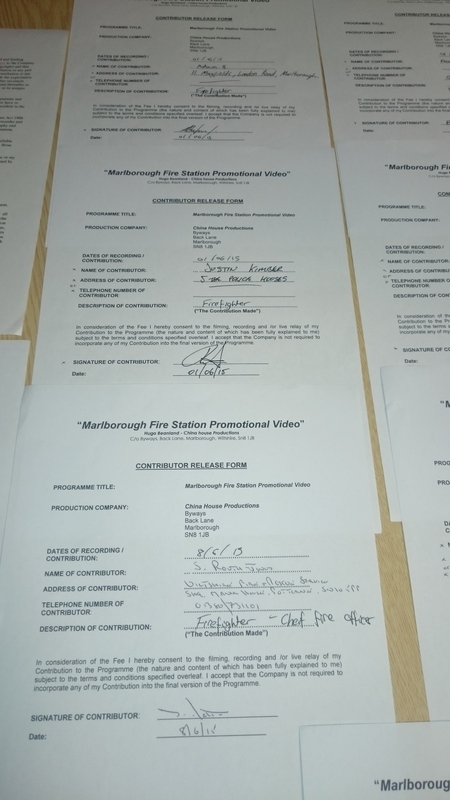 My back up was the Marlborough Fire Station, however after I changed the all of the paperwork I only had one week to film and edit all of the new footage. This meant that I was unable to film some things that would have been great for the video as they took place a few days before. I was able to attend two drill sessions with the station on both monday nights, this allowed me to film lots of things to use as cut aways, and conduct the nessesary interviews to complete the promo. The first person I spoke to was Roger Lovelock, one of the fire men at the station. He put me in contacted with Louise Knox, the PR manager for the wiltshire fire and rescue, and Wayne Presley, Watch manager at Marlborough Station. After this I was able to email them and get all the information and permission about filming with the station. These are E-Mails between, Wayne, Louise and Roger that explain the process of allowing me to be able to film. This it was a series of phone calls and face to face face talks, about who, what, where and when I would be filming. The two E-Mails below show the further communication between myself, Louise and Wayne. 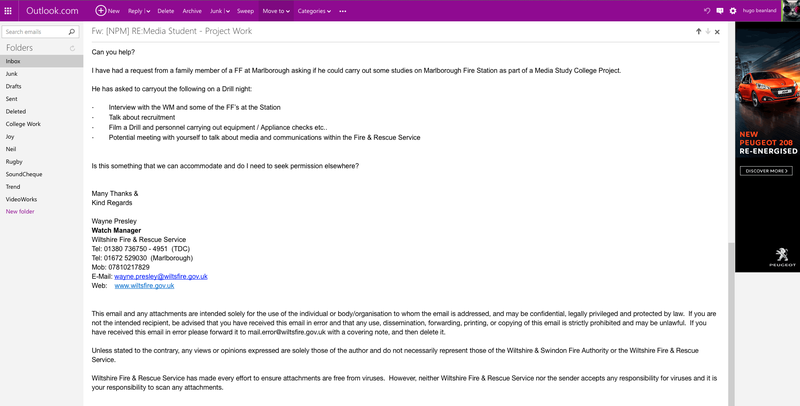 The first E-Mail is for Louise and the Fire and Rescue service, for their records, just saying what the Video is for and how I would be using it. The second is giving them a link to the Video so that they can check it to see if they want anything changed. We have been asked to make a promotional video for a company, organisation or individual of our choosing. 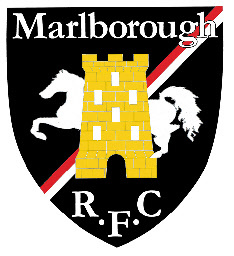 I have chosen to do a video for Marlborough RFC. This is because I play there and I think that more people need to get involved with them as they have lots to offer. My plan is to have interviews with, a current coach, the clubs bar and club manager, a current player, and a sponsor from Smiths Gore. 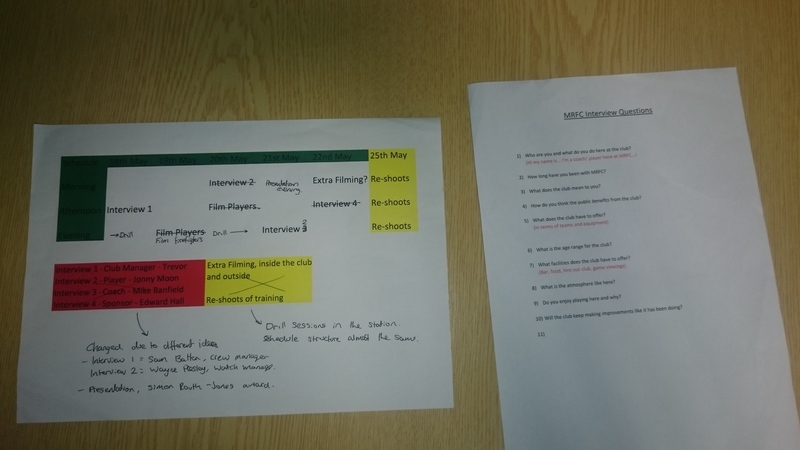 This will give a wide range of shots to use as-well-as a lot of information about the club and what its got to offer. Because the rugby season has finished, I am going to be filming a touch training session, this should hopefully take place on Tuesday the 19th, during the second production week. 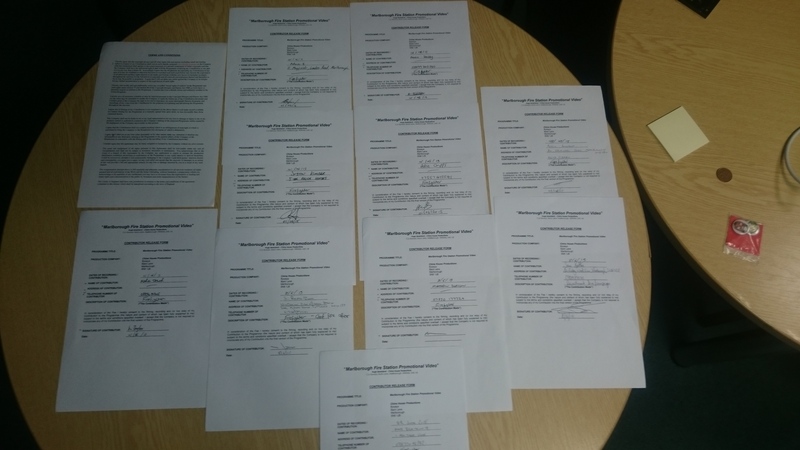 The interviews will done at the availability of each interviewees over the next two weeks. 2 Cameras, (one will be stationary and the other will be moving around, this will be during the touch training filming). All of The Interviewees. (Four in total). For parts of my music video, you can see Ben Davis not singing, but the song is still playing as normal, some inspiration for this came from the ‘Red Hot Chili Peppers’, in a song of theirs ‘Can’t Stop’ you can see the lead singer not singing. I though this was quite a good effect that I wanted to try out. The inspiration for my abstract 3D effect that I put over the band also came from watching the ‘Red Hot Chili Peppers’. They use some coloured effects to outline some of the band members in their videos for ‘Under the Bridge’ and ‘By the Way’. I think that this give the audience something more too look at, rather than staring at a plan screen, adding interest to the video. I had wanted to use coloured powder or paint for a long time in a video, so I started to look at videos, such as tutorials and other places that it had been used. I came across a video called ‘Summadayze Colourfornia’. This made me want to shoot may idea in slow-motion. When it came to my filming days, I was using a standard Canon DSLR, and my Sony Xperia Z3. My plan was to change the speed of the footage in the editing stages, using Final Cut Pro X. However it looked jumpy, so I decided to leave it at full speed. This was due to the filming equipment I had available to me at the time. If I had a camera that could shoot in many different frame rates, I could have used the slow-motion idea. After I had finished the music video, I emailed a link to Ben Davis, he said that he intends to use it to promote himself as an artist. He also said that he might be in touch to get a hard copy of the video. If I was to make another music video using paint powder, I would have pre-planned my locations more than I did. However because I didn’t have easy access to them this made it hard to do. When I went to Fulham to film Ben Davis, we spent the first day walking around to find locations that could look good when using the powder. This was not needed after Ben became unwell and wasn’t able to film. I had to re-story board, for when I drove to Portsmouth to film. I chose to shoot on the beach. My other location was on college ground, this is where I filmed the flour scenes. What I think went well. I think that filming on the beach was a good idea because it contrasts with the colourful powder that is being thrown, it also goes with the tone of the music, light-hearted and ‘fun’. I also think that my other two locations worked well, the plain white background, with black t-shirts, and the same for the flour scene. These two locations and costumes, are meant to show the plain emotions being expressed in the music. When I filmed the paint powder, it would have been better to film somewhere less windy, this is because the paint separated before it hit the subject. I also would add in a narrative to it gives the viewer something else to follow, when watching the video.